Is ROTC Poised for a Comeback at Elite Colleges? Shawna Sinnott spent the last four years performing a balancing act: she took courses for her self-designed major at Harvard, practiced her jazz number for the Miss Massachusetts Pageant, and woke up at 4:30 a.m. three days a week for Navy ROTC training across town at MIT. She was one of 11 Harvard graduates commissioned into the Armed Forces this May in a ceremony on campus that some see as easing tensions between the university and the military. 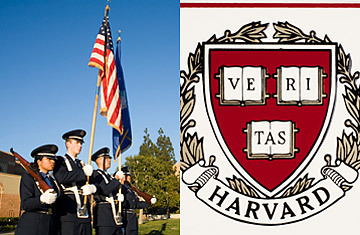 Harvard is one of several elite colleges that do not formally recognize the Reserve Officers Training Corp, which trains students at hundreds of schools but is not recognized at most of the Ivies and other top-tier universities because the military violates their anti-discrimination policies. However, these schools' opposition to ROTC, which started on many campuses during the Vietnam War, could soon change if Congress repeals the federally mandated policy of Don't Ask, Don't Tell (DADT). See TIME's special: "Back to Campus." Stanford's Faculty Senate has already installed a committee to investigate bringing a program back to campus, but with DADT still in place, most of its peer universities are not willing to comment on any potential plans, a sign that ROTC is still a sensitive subject. "If DADT was repealed, then ROTC would probably be an attractive option to more students," says Tom Conroy, the deputy director at Yale's office of public affairs, where students currently face a commute time of up to three hours roundtrip to the University of Connecticut. But, he added, "for the time being, the number of interested students is lower than what it would take to support an ROTC unit." Paying the salaries of training officers as well as covering costs of student equipment, uniforms, textbook allowances and monthly living stipends means that the military cannot sustain units that have only a handful of cadets. Plus, each branch of the military offers scholarships, some covering full tuition, making ROTC a lucrative option for the more than 30,000 cadets enrolled across the country. Michael Segal, a Harvard graduate and member of the coalition group Advocates for ROTC, argues that for schools like Stanford and Columbia, which have strong engineering programs, the benefits of bringing ROTC to these campuses could outweigh the costs of maintaining what will likely be smaller units there. "It may look on paper that these schools get half as much value as ROTC does at other programs, but we need some of these people," he says. "We need very thoughtful people in the military." Read "Why the Ivy League Is Rethinking ROTC." "[ROTC] shouldn't just be southern-conservative," he adds. "People who spent years in New York could be in a much better position to understand multicultural situations that the military is dealing with." Only two Ivies  Princeton and Cornell  have maintained training facilities on their campuses. Meanwhile, cadets enrolled at other elite schools have to travel to neighboring universities, and usually have to find their own means of transportation (Sinnott referred to herself as a "midshipmen chauffeur" because she was the only cadet with a car). Moreover, ROTC participants at schools like Harvard and Yale do not receive course credit for military science classes. Reversing that policy, Segal says, could provide symbolic value even if units are not reinstalled on these campuses. Today, around 40% of military officers are trained through Army, Air Force or Navy collegiate programs. But ROTC's absence even from a handful of universities is a growing concern for academics. "There's strong note of worry that the military is becoming a separate institution from the society for which it fights," says Stanford History professor David Kennedy. Sinnott agrees. "I was very surprised, some people [on campus] have never met anyone in uniform," says Sinnott, who is now a Second Lieutenant in the Marine Corp. "That was shocking for me growing up in a military family." Until the status quo changes, there are at least some undergraduates at elite institutions who will continue to travel to ROTC programs on other campuses. "It's about the same time commitment as a varsity sport," Sinnott says of her years in ROTC. "But the stakes are higher because what you're doing determines if people are going to live or die."